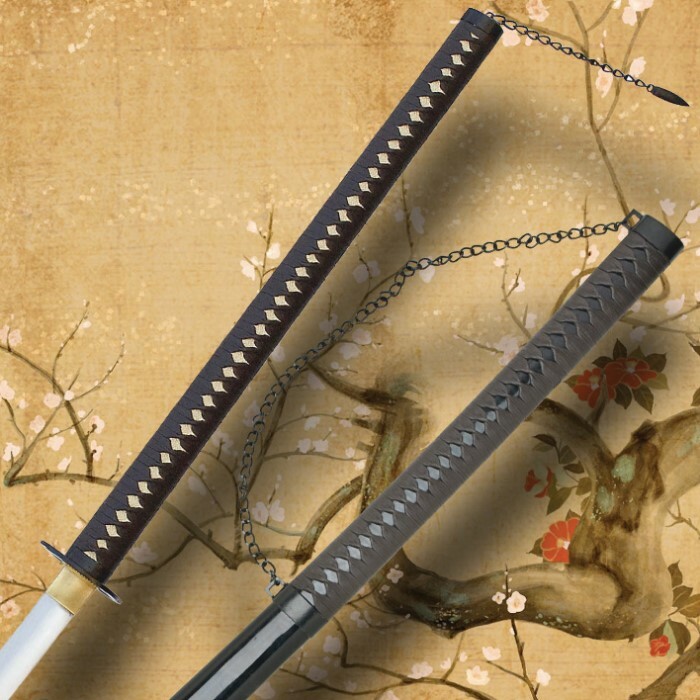 Japanese Odachi Sword | BUDK.com - Knives & Swords At The Lowest Prices! This massive Japanese Odachi sword is an outstanding example of craftsmanship. The odachi was used on early Japanese battlefields but its size soon relegated it to use as an army's standard or as an offering to the gods. 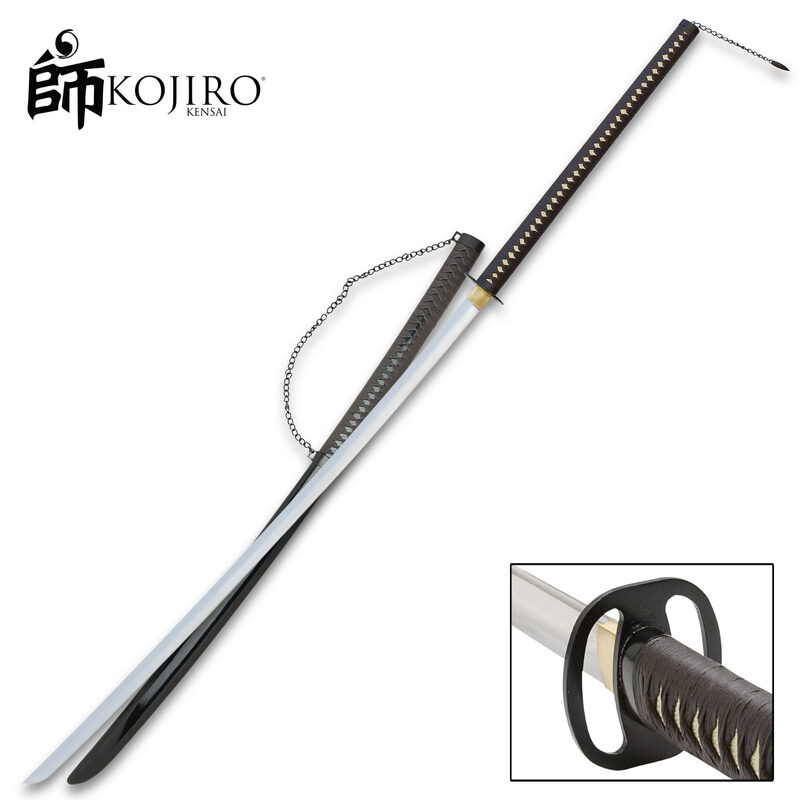 Stretching 69" long with a heat-forged 45" carbon steel blade, this sword has a powerful full-tang construction. The hardwood handle is traditionally wrapped with leather. A black lacquered wooden scabbard houses the blade. This is a superb item, and, one you'll definitely want to add to your collection! Everything intact. Liked the brown leather wrap. Paint on scabbard is black not brown. Description mentioned red tassels before now it doesn't hmmmm. Blade is a little misdirected which gave tighter fit into the scabbard which was fine. Overall not bad for cheap wall hanger. Shipped VERY promptly and was well-packed. This is a beast of a sword! It matched the site's description with the exception on having no edge at all. An excellent value for the price. My only complaint is that the blade was very difficult to draw from the saya and I cannot get it resheathed completely without using a great deal of force on the last couple of inches. It is almost more of a nagamaki than an odachi but still a very nice buy for the price! It came with the blade like it was twisted didn't like the cheap vinyl leather. For the price, this sword is excellent for training. The blade is of carbon steel, so under stress it bends instead of breaks, which is preferable in a desperate situation. The tang isn't full, but there's 5-6 inches near the end where the handle is hollow. I just hacked the end off and mended/reinforced the handle with duct tape, and it still works fine, despite the blade's obvious bend. I train on wood, so the blade would be in better condition if bought by a seasoned practitioner of the art of the Odachi. This is a very good sword for exhibitions and resistance training for your body, with sharp changes of direction during strikes. I myself have very much enjoyed this sword, and do encourage anyone looking for a training sword to buy this sword, but use with caution. Someone in the description called it a display sword because his friend hit a tree branch with it and the blade was damaged. SWORDS ARE NOT MEANT TO CUT DOWN TREES OR THEIR BRANCHES. You can go buy a $900 sword and whack a tree with it and I guarantee the blade will till be damaged, maybe not to the extent of bending the blade like this one would be but the blade would still be in need of repair. If you want to whack a tree buy a machete or an axe, something actually designed for hitting trees. Note. Swords also aren't meant to collide with other swords, as it damages the blades, swordsman would usually dodge swings and parry with the side or back of the blade if they absolutely had to, but never with the blade. If you want to use this sword for slicing up water jugs or watermelons or sword cutting matts then it will work just fine. Just remember to keep your blade oiled to prevent rust. @ MATTHEW ....THE DISCRIPTION OF THIS SWORD SAYS THE BLADE IS 45 (INCHES) LONG ! NOT THE TYPE OF STEEL USED TO FORGE IT ! DUDE NEEDS GLASSES . I WILLL ORDER ONE OF THESE ON THE FIRST OF THE MONTH OF MAY 2015 . THE PRICE IS RIGHT FOR SURE ! 1045 is 5 pts above Ornamental iron. It can be hardened and even doing so only requires water. But it is not steel. Not steel not a sword. Polishes great and easily and can almost hold an edge. My first mentor liked 1040 iron for gates. Just got this massive bad bot and I love it. The weight is more than I expected so I have to work on my swing. My chain tassel thing was fine no damages there. The leather wrap is ok quality and the bamboo pegs used to fasten the handle together are done badly. How ever the sword still feels solid. The blade is of the same quality as most 30-40 swords no suprise there since it has Made in China stamped on it. I haven't tried any test cuts yet, still working on the weight issue. Is nice sword for its price but thats about it for me, not saying there anything bad about it but it just wasn't really what I was hoping for, basically I was looking for a blade length thats much longer than the handle, didnt expect to see that theb handle is almost as long as the blade. Just feel very weird for me. Overall is a nice sword for this price.